Laura has become a secret Seedaholic. Although we have loads of flower seeds she has been ordering from T&M and one of my favourite seed suppliers, Higgledy. She is in love with growing things so for her birthday on 18th April I bought her a walk in greenhouse, just a plastic one from Wilkos, but she loves it. A bit of compost a few pots and seed trays and she was off. Her latest seed purchases from Higgledy are Chrysanthemum Crazy Daisy, Zinnia Persian Carpet Mix, Echinops Ritro, Tithoria Torch and Statice Blue. She loves all things ‘Daisy’ so I have given her a new name, Crazy Daisy, after the Crysanth she chose. The name suits her to a Tee. Higgledy £1.95 – Chrysanthemum Crazy Daisy is widely regarded as one of the best Chrysanthemums for the cut flower garden. Lots of white and cream flowers. Blooms are numerous and the white frilly petals have egg yolk yellow centres. This is a no fuss easy care perennial and a great addition to your perennial bed in the cutting garden. Sow seed from February-May or August-October, into trays of compost and lightly cover seeds with vermiculite as the seeds need light to germinate. Keep at temperature of around 15°C. Germination usually takes between 3-4 weeks. If there is low germination rates induce a period of vernalisation where the seeds dormancy is broken by moving to a cold area about 4°C for a week or so and then return to 15°C. Once seedling are about 5cm tall pot on into individual pots. Its August and these flowers are just beginning to open. They belong to the Chrysanthemum family and should be sturdy perennials. Higgledy Free Gift – Zinnia Persian Carpet is a very elegant and charming flower. Colours range from deep reds to shining yellows on single and bicoloured blooms. The flowers themselves are more compact than most Zinnias but also more abundant. An old fashioned variety. Drought tolerant. Take care if sowing in pots as Zinnia do not like root disturbance. Sow them in May directly into the soil after the last frost. I’ve sown a few seeds into a small pot on 4th May 2018. Its August and we have these flowering here and there in pots. The flowers are a very striking bright orange with red accents. Higgledy £2.25 for 50 – Echinops Ritro. Echinops is Latin for hedgehog apparently. Flowers are beautiful silvery blue spikey spheres. Foliage is also a striking blue green colour. As cut flowers they are very versatile and they dry easily too. Echinops is a hardy perennial much loved by bees and it self seeds. A tough plant for the back of the border. Higgledy Tithonia Torch £1.95 for 50 – Mexican Sunflower. Tall vibrant dahlia like flowers ideal for the back of the border. Easy and fast growing. This variety has extreme tolerance to heat and drought making it very useful for those dry areas of the garden. It produces brilliant deep orange flowers that are 3″ across on a plant that spreads to 3′ wide. Sow the seeds From Feb – March in trays of a good quality seed compost. Cover lightly as light is needed for germination. Germination will take between 18 – 30 days. Plant out in late Summer.These plants will not require very much care. A little fertiliser every now and then and occasional watering will be ample. Best planted in full sun. Its 3rd August and Laura has been very disappointed with these plants as they are not very attractive foliage wise and so far the only one to flower is bright a bright yellow sunflower. We should have realised what the foliage would be like as the name does say Mexican Sunflower and sunflower foliage isn’t very attractive. Update – Its 7th September and still no flowers from these seeds. 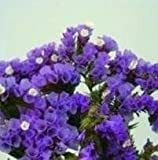 Higgledy Statice Blue £1.95 for 100 – Statice is easy-to-grow from seeds and it is very rewarding with bright blue, flat flower clusters of a papery texture that hold their color well . Usually used in dry flower arrangements. Its 3rd August and these plants are just coming into flower.